Todoko-Ranu Volcano in north-western Halmahera 15 km SW of Gamkonora volcano is a part of a larger volcanic complex, which contains 2 calderas. One of the calderas, Ranu caldera, contains a crater lake. The twin caldera complex of Todoko-Ranu is part of a large volcanic complex south of Gamkonora. 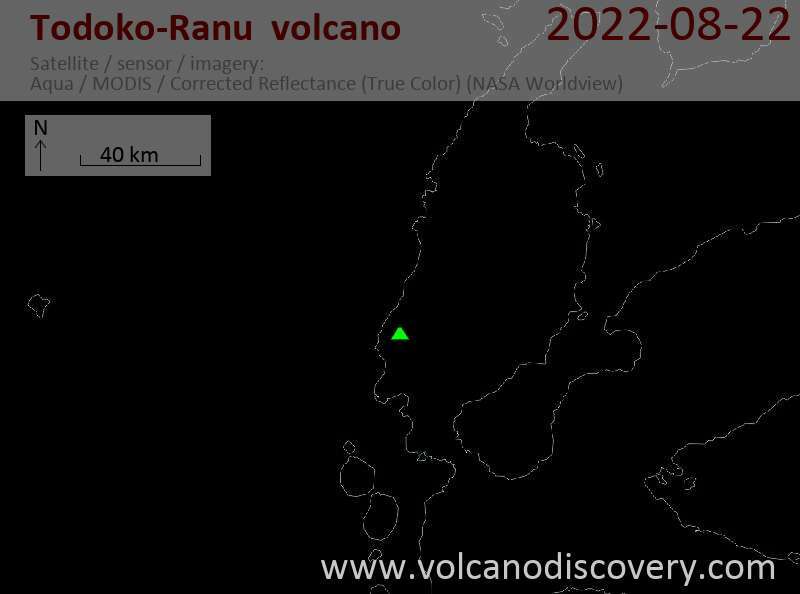 The 2-km-wide, lava-filled Todoko caldera is south of the 2 x 2.8 km wide nested Ranu calderas and contains a young post-caldera cone, Sahu, on its south flank. The northern Ranu caldera contains a caldera lake. Gunung Onu, NW of Ranu caldera, lies at the northern end of the Todoko-Ranu complex. No historical eruptions have been reported from the complex, mapped as Holocene by Supriatna (1980), but fumaroles are present at Ranu caldera and hot springs on Mt. Sahu. Youthful-looking lava flows reach the sea from several locations within the complex.